Every couple desires a long and loving marriage, one that can overcome difficulties and survive hard times. But sometimes couples need help. Across the nation there are many seminars, conferences, fellowships, and retreats that address what makes a successful marriage. 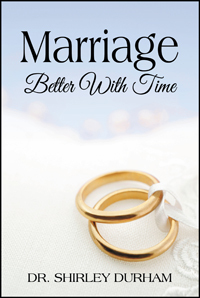 In Marriage, Better with Time, Dr. Shirley Durham offers her own recipe for a successful marriage, combining the word of God with the professional advice she gives her clients. She discusses sharing, finances, communication, praying together, and even taking a vacation, drawing on examples from her own marriage as well as the real-life challenges of husbands and wives who seek her counsel. Warning that society poses a potential danger to the biblical principles of marriage, Dr. Shirley provides the antidote to help couples, young and old, avoid unhealthy marriages, endure life’s changes, and stay together. 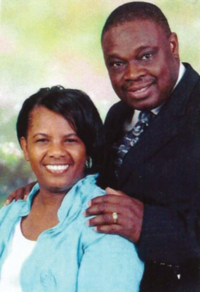 Dr. Shirley Durham is a faith-based belief therapist and anger management facilitator in Arlington, Texas. She is the author of Pastoring from Scratch.